I know I'm not completely insane. I wrote it down the name but now I can't remember were I put it. A largish Spinosaur/Megalosaur from the mid to late Jurassic of England. If anyone has any idea what the name of this beastie is please let me know! Update: Thanks to Andrea Cau of Theropoda fame for figuring out my scambled ramblings. More when it's colored! Cruxicheiros, the new tetanurine going to be published in Acta Palaeontologica Polonica? Yes Cruxicherious! I knew the name was a bit strange to me. Thanks! I'll have to update this! Ezequiel, I have drawn both of those in the past. 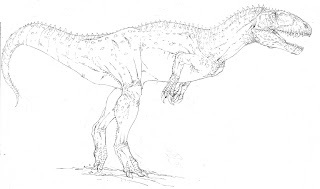 I thought I had a colored version of Eustreptospondylus but maybe I had started one and never finished. I'll have to look! Fascinated by the spikes you draw running along the backside of the arms and legs... are these feather remnants? Scutes? Are these the result of finds, or imagination? They seem plausible (to my non-scientific eye) and look cool (to my artistic one). Looks awesome!. But this guy is on megalosauria family? I saw this is on tetanura family. Sort of like a prefeathers. I started putting them in the area where the longer 'flight' feathers would go. I've only recently started putting them on the legs as well as the arms, for some reason even large naked theropods bother me so I have to stick something on there.